The US Naval Academy (USNA) is located in Annapolis, Maryland, one of the East Coast cities that has already seen a marked increase in the frequency of tidal flooding events. 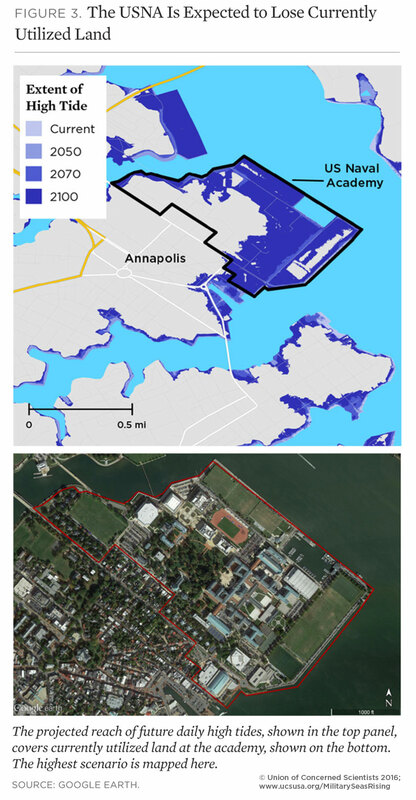 Today the Annapolis waterfront—including parts of the academy—experiences roughly 50 floods a year. As sea levels rise, the USNA is projected to experience roughly 400 tidal flooding events per year by 2050, or more than than one per day on average. 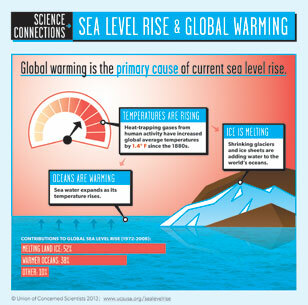 Sea level rise could also claim currently utilized areas; currently flood-prone areas are projected to be almost constantly underwater by 2070. 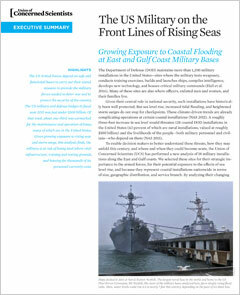 Seas are projected to rise between 4.0 and 6.4 feet by the end of this century in the area around the USNA. The US Naval Academy, one of five service academies in the country, trains students who go on to become officers in the Navy and the Marine Corps. The USNA is located in Annapolis, Maryland, where the Severn River joins the Chesapeake Bay. It is situated within an East Coast sea level rise hot spot, where natural subsidence, low-lying topography, and changing ocean circulation patterns contribute to above-average rise. 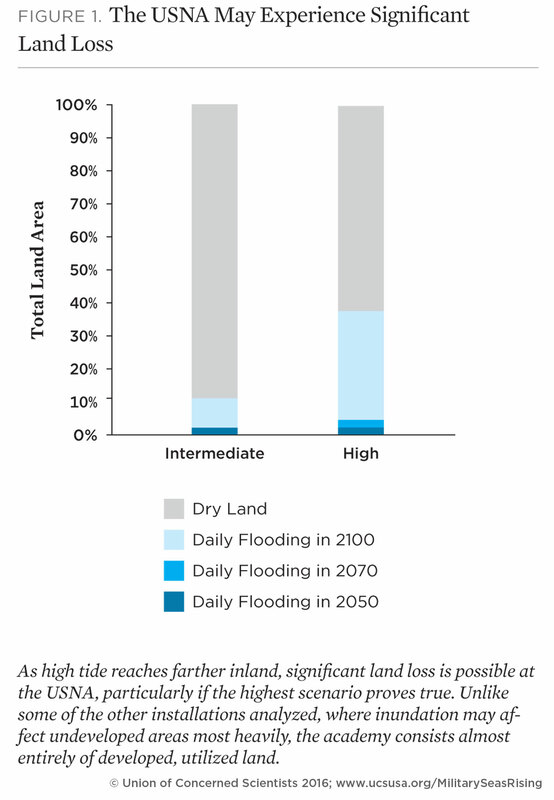 The academy's exposure to coastal flooding is projected for the years 2050, 2070, and 2100 based on the National Climate Assessment’s midrange or “intermediate-high” sea level rise scenario (referred to here as “intermediate”) and a “highest” scenario based on a more rapid rate of increase. The results below outline potential future flooding scenarios for the USNA, assuming no new measures are taken to prevent or reduce flooding. Flooding during extreme high tides will become more extensive. Today, the Annapolis waterfront, including parts of the academy, is affected by flooding during extra-high tides roughly 50 times per year. In the highest scenario, almost 15 percent of the academy is flooded with this same frequency by 2070. Certain locations could flood with each high tide. The intermediate scenario shows the USNA experiencing roughly 400 tidal flooding events per year—on average, more than one per day—by 2050. By 2070, flood conditions begin to span several high tide cycles and floodprone areas are underwater 85 percent of the time. Sea level rise could claim currently utilized areas. In both scenarios, currently flood-prone areas are underwater nearly constantly by 2070. In the intermediate scenario, with four feet of sea level rise, roughly 10 percent of the academy’s land area is part of the tidal zone (flooding daily) by 2100. In the highest scenario, which projects 6.4 feet of rise, the area that floods with daily tides climbs above 35 percent by 2100. Sea level rise exposes previously unaffected areas to storm surge. In both the intermediate and highest scenarios, sea level rise increases the area exposed to flooding from Category 1 storms by nearly 30 percent by 2100. Sea level rise exposes the academy to deeper, more severe flooding. Today, most storm surge flooding from Category 2 storms is less than five feet deep. By 2100 in the intermediate scenario, Category 2 storms expose one-third of the academy to surge flooding five to 10 feet deep. Recognizing the threat of increased flooding, the USNA has multiple flood hazard mitigation measures in place and in process. Academy staff have been repairing its seawalls and installing necessary backflow preventers within its storm water system. Door dams designed to protect academic buildings and other structures from flooding have also been installed. The USNA is also currently working on a flood mitigation design informed by the Army Corps of Engineers’ analysis. But there is still far to go: The gap between the military’s current preparedness for sea level rise and the threats outlined here is large and growing. In order to plan effectively for the long term, military decision makers with authority over the USNA need to understand how sea level rise may permanently alter the landscape of this coastal installation and where the threat of storm surge may become intolerable. To take action, however, individual installations like the USNA will need more detailed analysis and resources to implement solutions. Detailed maps for each scenario at the USNA are available via Dropbox.